Dill is a tall, lanky annual with umbrella shaped flower heads that produce the famous seeds that are used to make dill pickles. While leaves of Dill can be used in pickling, it is the seeds that contain the essence we taste in dill pickles. 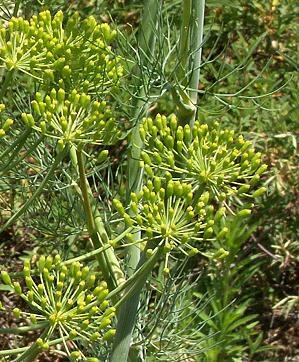 When Dill plants start to make seeds, usually in late summer, keep an eye on the flower heads. When the first seeds fall, harvest the whole head and finish ripening it in a paper bag. The seeds shake free when they are fully ripe and can then be stored in an airtight jar. Of course the Dill leaves also have a lot of uses and are loved by cooks around the world. Like so many culinary herbs, the flavor of the leaves of Dill are best when the plant is not flowering. Cutting out the center stalk can delay flowering some, but it is really best to succession plant Dill. By planting every 2 or 3 weeks, Dill leaves can be kept at the ready for fresh use. Fresh leaves are superior to dried or frozen leaves, although these can provide a mild Dill flavor. Dill leaves should always be added toward the end of the cooking process. If they are added too soon the essence cooks out. 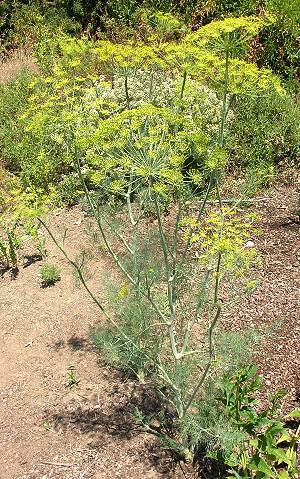 If Dill plants get a lot of water or extra shade they can be very floppy and supports may be necessary to keep the seeds from ending up in the dirt. If the soil is poor and too dry, it will stress the Dill roots and the plant will likely bolt or try to go to seed before it matures. 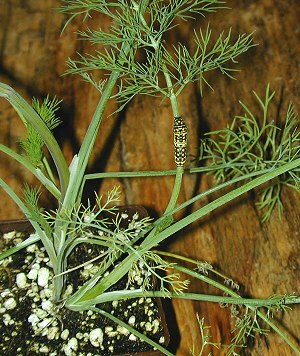 This Swallowtail Caterpillar likes Dill almost as much as we do. Maybe more! By the time this little guy and his friend were finished this Dill plant was nothing more than some green sticks. And, the caterpillars were a whole lot bigger! We didn't mind though because we planted enough for everyone. Dill makes a tasty addition to our Edible Flower Herb Garden Six Pack and our Small Space Herb Garden Six Pack. This plant is sometimes available in plug trays. These trays hold 128 of all the same plant. They are a great low cost way to fill a lot of space. Each cell is 3/4 of inch by an inch. Check here to see if Dill Plug Trays are available.